Kiran (age 5) regurgitated her breakfast yesterday morning - the first day back after the Christmas holidays. There seemed nothing else wrong with her - she was as bubbly and energetic as expected first thing in the morning, so I was sorely tempted to send her into school. She likes school, and bunking off over minor ailments is a bad habit to get into. However the school rules are clear - they can't go back to school until 48 hours after they last vomitted. I'm sure many parents' childcare arrangements preclude following this rule, but in our case it makes little difference. So she's been off school, and we've had some super quality time together. Still, I'm reluctant to make it too much like a holiday so I've given her some school work to do. She's read half a dozen books. 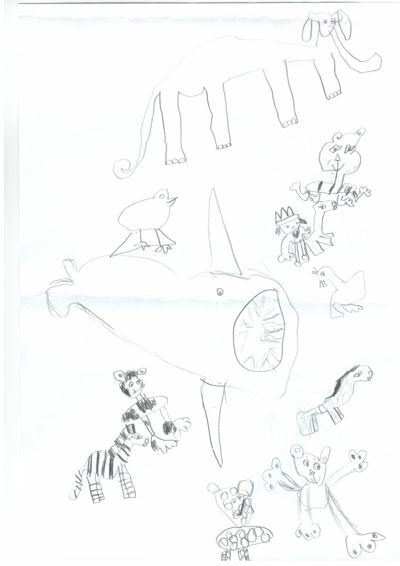 We watched some of David Attenborough's Planet Earth, and she drew some animals from it. How cool is that zebra? Today she made my lunch. I'll miss her when she goes back, tomorrow.